What is a marine pest? Introduced marine pests are species moved to an area outside their natural range, generally by human activities, and that threaten the environment, human health or economic values. 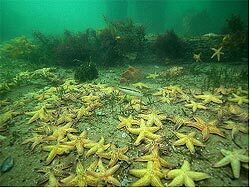 They can include mussels, crabs, seaweeds, sea stars and other marine species. However, not all marine pests are from outside Australia. Some are native to other regions of our country and have been transported into NSW, for example, through domestic shipping or the aquarium trade. Marine pests are introduced to Australian waters and transported inside our waters by a variety of means; including ballast water discharged by commercial shipping, bio-fouling on hulls and inside internal seawater pipes of commercial and recreational vessels, aquaculture operations (accidentally and intentionally), aquarium imports, as well as marine debris and ocean currents. Each day, around 3,000 species of marine organisms are transported around the world in the ballast water of ocean-going vessels. These invaders, along with the ballast water, are dumped at their destination to make way for cargo. In 1993, 121 million tonnes of ballast water were dumped into Australian ports - equal to one quarter the volume of water in Sydney Harbour. 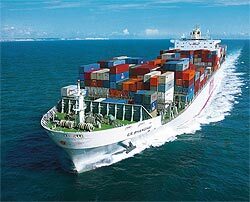 about1.19 billion metric tons worth of cargo.